Starting any new business can be overwhelming. At Ultimate Jumpers, Inc., we have been in the inflatable manufacturing business for years. We know all of the inside information when it comes to a path to success for rental companies. 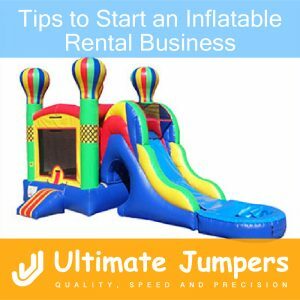 We want to share our tips to start an inflatable rental business with you. Business Name/License: You need to obtain a business license once you have come up with a proper name. Also, location must be determined. You might want to have a home office and store inflatables in your garage to keep your costs low for the time being. If you are opening up a business location make sure you have the proper permits and licenses. Know Your Competition: Try to find out as much as you can about the rental businesses in your local area. Get familiar with the products and services they offer at the prices they offer them. You will be able to gather information for your own business as far as what you should be offering. In addition, you may want to consider adding other rental products to your rental business. This is a great idea because most people like to rent everything from the same place to save money and time. In addition, try to find out what areas your competitors deliver to and what they charge for their deliveries. Set Up Operations: Once you set up your phone lines (800 number, cell phone, etc), think about the other aspects of running the business. For example, business cards, rental agreements, website, insurance, and bank accounts. Similarly, make sure you have the transportation covered (getting a proper vehicle and moving equipment, such as a pickup truck or van). In addition, make sure you are available for your customers to call, leave messages, and get their questions answered. A potential client may choose your rental services above your competitor’s for your incredible customer service and attention to detail. Advertising: Social media marketing is one of the most effective forms of advertising these days. Get your business profile set up on instagram, facebook, google, etc. Clients will be able to search for your business, comment on your posts, and provide feedback/reviews. In addition, make sure your inflatables have your business banners on them for easy advertising at parties and events. Similarly, you can pass out your business cards and flyers at those same events. Inventory: Once you know how much money you want to invest on inventory, do some research on quality vs. quantity. Make sure you are getting warranties on the units you are purchasing. As you purchase more inflatable units, have them added to your website. As you are picking the units that you want to purchase, pick the ones that will attract the crowd (color, shape and theme). We hope that the information provided will help you through your start up process. Should you have any questions please feel free to contact our experienced and friendly staff at 800-219-9211.